HELENA-WEST HELENA --- The National Weather Service in Memphis, TN issued, at 4:25 a.m., a flood warning for Phillips County, Arkansas. RECENT HEAVY RAINFALL COMBINED WITH BACKWATER FLOODING BY THE MISSISSIPPI RIVER HAS LEFT MANY AREAS FLOODED ALONG THE 100 YEAR FLOOD PLAIN. THIS HAS RESULTED IN NUMEROUS ROAD CLOSURES AND AREAS POTENTIALLY UNDER THE THREAT OF EVACUATION. STAY TUNED TO THIS BROADCAST FOR THE LATEST UPDATES AND INFORMATION. TO REPORT SEVERE WEATHER ONLY... CALL 1 800 4 3 2 0 8 7 5. The National Weather Service has reported that this warning ends at 6:15 p.m. on tomorrow, Sunday, May 8, 2011. 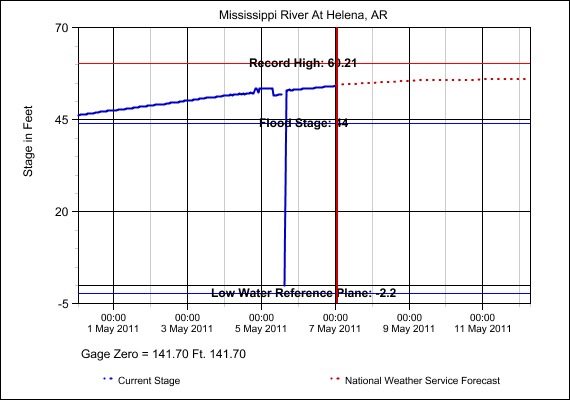 The river is expected to crest at about 55 to 57 feet on May 12, 2011. There are several high water areas along the Mississippi River in the Phillips County area. The Helena Improvement District put of the gates in the levee wall out of concern earlier this week. They also closed the gate on the Walker Street Levee to prevent a backflow of Mississippi River water into areas of town. We have been made aware of rampant concerns about flooding and evacuation plans. At this point, however, nothing in the projections indicates that there will be a need for evacuation in the Helena-West Helena area of Phillips County. There are other areas in Arkansas impacted by the flood warning and the high waters on the Mighty Mississippi River. See List of Affected Arkansas Areas. Police are going door to in Memphis, TN urging evacuation. 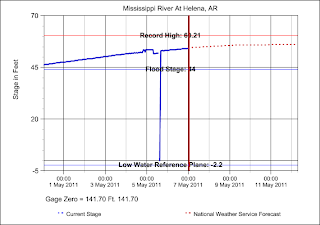 Helena-West Helena has not yet reach a point where evacuation is a serious concern. Stay tuned to The Inside Scoop Online for further updates on this and other important matters. Listen to The Inside Scoop on KJIW FM 94.5 at 11:30 a.m. on Saturday mornings and 11:05 p.m. on Saturday nights. The broadcast are also available live at http://www.kjiwfm.com at the listen live link. Podcast are made available in our podcast section at the bottom of this webpage.